This year is different. There are no remaining hotels in the CCI system. Before we've usually had a few stragglers left - not the hotels you wanted to book, but places that still put a roof over your head. People coped and moved on. This year we'll probably see a few more rooms flicker in and out of existence but there's no sure thing for anyone to bank on. Hopefully all of you have somewhere to stay by now. If not, you should keep checking Gaslamp hotels; they will have more cancellations over the next few weeks but they won't stay on the shelf long so be diligent. 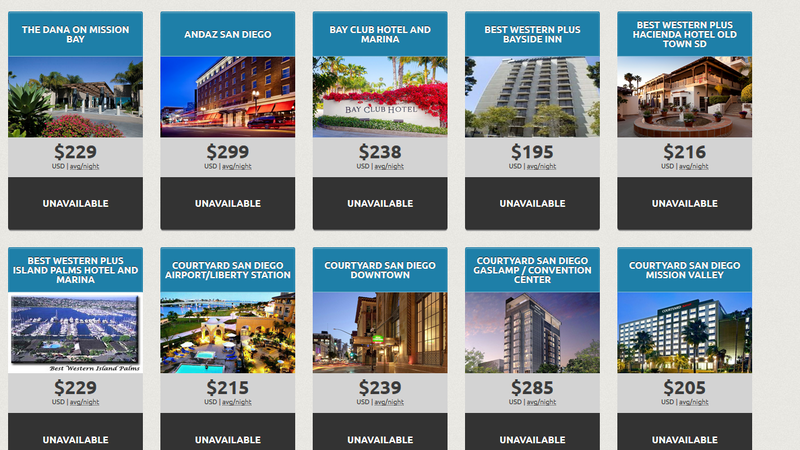 There are also more distant hotels with rooms available. Go through Early Bird to book your hotel. This year more than ever showed how unlikely it is that you'll get a downtown room. You may as well go for the sure thing, even if it's not in the Gaslamp. Look at it this way; I got into the hotel sale by 9:01 this year, earlier than most people, and wound up getting the Wyndham Bayside. (I gave it away.) That's considered a downtown hotel. Early Bird offers the Sheraton just a short distance down the road. If you're going to be riding the shuttle either way, what's the difference? Book a safety room. I know this seems expensive but if you can come up with the extra $$$ and find something refundable, it's the way to go. Rooms are already available for SDCC 2018 (I have a refundable room at the Keating booked) and they range from the Hyatt at $850 a night to the Dolphin Motel for $320. Keep looking and try to find a deal. You'll breathe so much easier once you get your badge. I know right now everyone is glad to be done with the badge and hotel sale madness, and people just want to focus on announcements. But as with all things Comic-Con, it pays to prepare. If you feel fairly committed to going to San Diego Comic-Con next year, even if you only pull down a Sunday badge, create a safety net now. The 2018 hotel sale isn't going to be any prettier.